Is your website ready for the next Google SSL update and how will it impact your business? Does your website start with “http://” or “https://”? If it is the former rather than the latter, your website visitors (and your business) may have a large surprise starting October 1, 2017! More simply put, if your site does not have an SSL certificate on October 1, 2017, Google Chrome will mark it as “NOT SECURE” if there are any text fields. What does an SSL do for me? 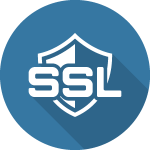 SSL (Secure Sockets Layer) Certificates encrypt the connection between the web browser and the server where the website resides. This makes it much harder for someone to intercept the traffic and steal the information, which in turn leads to a safer browsing experience for the average web user. This is the second step in Google’s plan to force users to employ an SSL certificate. Step one was implemented in January of this year. It marked sites as “NOT SECURE” if they did not have an SSL certificate and accepted personal data, like credit cards or PayPal. This step, implemented October 1, will mark any site with text fields as “NOT SECURE” without an SSL. The final step, planned to roll out soon, is to mark any site as “NOT SECURE” that does not have an SSL certificate. Because it is so much more secure, Google would prefer to have all websites protected by an SSL certificate. They have reinforced this notion in their ranking algorithm as well, with SSL protected websites ranking more highly. Your business and your website traffic are at risk with no SSL certificate! What should I do to avoid this situation? Talk to your webmaster or the person that handles your website hosting about adding an SSL. Don’t have an SSL or not sure where to start? Contact Integrity First Technology Solutions, Inc. (412.559.7177 or si@iftsdesign.com) and let them take care of it for you. Don’t miss this opportunity to upgrade your website. Protect your clients and your website’s reputation! Previous Previous post: Why Do I Need an Email Address With My Domain Name? Next Next post: Technical Series: Why Can’t I Send Email to Hotmail (and Other Email Providers)?! Technical Series: Why Can’t I Send Email to Hotmail (and Other Email Providers)?! Why Do I Need an Email Address With My Domain Name? Google wants YOUR website to be mobile friendly right NOW…Is it?